I have been blogging since October 2007. That's almost three years! I am grateful for everyone who has been with me in this journey from the very start or discovered the original URL http://listeningtohisvoice.blogspot.com at some point and have been engaging with me since then. I was able to get my own domain name (now http://www.happysammy.com) and have made it my "identity" throughout social media channels. I am grateful for a husband who bought the domain for me! I was able to hire a fantastic blog designer and we communicated with each other very well on how I wanted the blog look like. I am able to create content several times a week that consistently tied in with this blog's theme which is "Sharing my faith and my life one day at a time." My visitors that started from a couple of people have now increased to hundreds of unique hits a day. I'd love to say that everything just fell into place but nothing can be farther from the truth. If you have noticed the improvements, it is because I put some work into it. But how did I do it? This is where Darren Rowse of PROBLOGGER (in my opinion, the BEST blog out there on well, blogging) comes in. 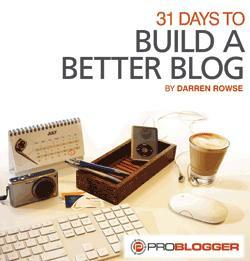 I bought his downloadable e-book "31 Days to Build a Better Blog." I was able to use the workbook faithfully because it was so easy to follow. Not only that, I can honestly say that at the end of the challenge, my blog has become a better place to go to. I wish I can personally coach you on how to make your blog better but it is not my content to share. What I can only do is point you to the source of the lessons. I signed up as an affiliate of the workbook late last year because it is an e-book I truly believe in and this blog really is a testimony of the results of the 31-day challenge. I will never promote any product on this blog unless I am an absolute fan! If you want to buy and download the e-book, it costs only $19.95. Just click on the button below. Once you are done with the payment process, you can download it and start the challenge right away! If you do decide to take on the challenge, please let me know! I would love to see your success story unfold. Hi Angeli! Let me know when you have the workbook already :-) And contact me if you have any questions on the tasks!